In honor of Mother’s Day, LightBox asked photographer Muhammed Muheisen to photograph Afghan refugee mothers in Pakistan, and to find out what it is like to be a mother under these difficult circumstances. For the last three and a half years, AP photographer Muhammed Muheisen has been photographing Afghan refugees who have found temporary shelter in the slums outside of Islamabad, Pakistan. He has worked particularly with the Pashtun community, one of the poorest and most vulnerable of the refugee population in that region. According to a recent UNHCR report, there are more than 1.6 million registered Afghan refugees currently in Pakistan; with this figure not taking into account the unregistered refugees, of which this community is comprised. In honor of Mother’s Day, LightBox asked Muheisen to return to this community to photograph the women who live there and have them say in their own words what it is to be a mother as a refugee. Below, TIME photo editor Mia Tramz and homepage editor Andrew Katz interviewed Muheisen about what it was like to be the first person to ever photograph the women seen in this essay. 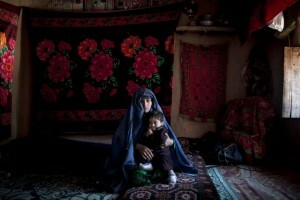 Mia Tramz: In your opinion, what is it to be an Afghan mother as a refugee? Muhammed Muheisen: Like being a superwoman. Their life is really difficult. No comparison to our life, or even to the lives of poor Pakistanis. They have three times more to do than a man. The mothers have to walk miles and miles every day to collect water and to collect wood. The wife is the mother and the father because she has to protect the children. It is the mother’s responsibility to keep the family as one body. In one of the photos you see the woman has her daughter wrapped inside her burka (slide 1). They’re so attached. You see the mother and her children all the time. Wherever they go, they go together. They speak their own language, Pashtun, and you hardly find anyone of them speaking Urdu. I saw hardly two burkas in one house. You see one pan, you see a couple of dishes, you see plastic glasses here and there, I haven’t seen spoons or forks. They mostly eat with their hands. Children wear the shalwar kameez [traditional clothing], but they have a lot of spares. You see most of them with holes in their clothing, old stuff. Much of it was found it in the streets. Their houses, their makeshift mud houses are very, very tiny. They have these monsoons where it pours rain and their houses are flooded. You wonder how they live. But they live. They’re strong. They have this way of adapting, of surviving. We complain about things, but their complaint is just to live. And eat. Arun Gandhi: “Paying lip-service or Act, on Gandhi Jayanti?